Explore the Elemental Temples in Fireboy and Watergirl 5 Elements Game! Solve many puzzles, collect all the diamonds and beat the time. Fireboy and Watergirl Elements is a completely new game with lots of new elements. Travel to all temples in the Fireboy Watergirl series. Enter the new Fire Temple, The Forest Temple, The Ice Temple, The Light Temple, The Wind Temple and The Crystal Temple. In Fireboy and Watergirl 5 Game you can play the adventure alone or with a friend. Reach the exit safely. So work together and use each character’s special talents to beat the puzzles and finish the levels successfully. Also you can play this game on all devices. 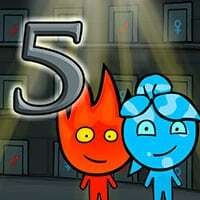 So enjoy and have fun in playing Fireboy and Watergirl 5 Elements Game. Good luck.